Printing, sculpture and the Hypnerotomachia Poliphili: display and lecture, 6 Feb.
On display in the Proscholium of the Bodleian Library now are examples of Renaissance books from the printing house of Aldus Manutius (c.1450-1515). 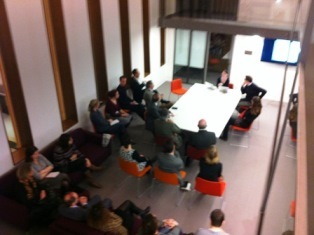 Reception following hosted by the Centre for the Study of the Book and the Ludwig Boltzmann Institute for Neo-Latin Studies. Author Andrew BonniePosted on January 26, 2015 Categories 15th century, EventsLeave a comment on Printing, sculpture and the Hypnerotomachia Poliphili: display and lecture, 6 Feb.
Lantern slides, Archive of the Society for the Propagation of the Gospel. Credit: USPG archive. Copyright Us. The papers of the United Society for the Propagation of the Gospel (SPG), an Anglican missionary organization formed in 1701, is a vast collection comprising items from the organization’s origins until the 1960s. The SPG was active around the world, and its network of missionaries and clergymen left a wonderful trove of correspondence and diaries of their work overseas. The records include executive minutes, financial records, books and catalogues, periodicals, and maps, representing a wide variety of historical materials. The collection provides an important lens into the Anglican Church’s global expansion and colonial encounters in the British Empire. 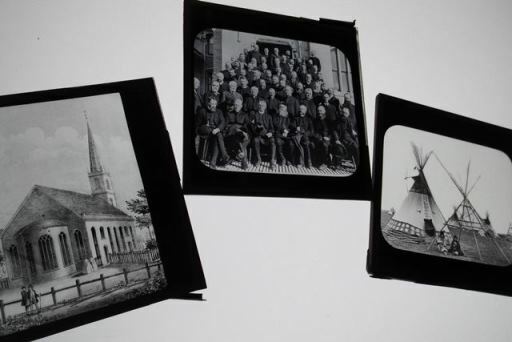 A unique item within the collection is an assortment of lantern slides that date from around the turn of the twentieth century. There are 75 boxes of varying sizes, many of which hold dozens of slides each. The square panes of glass typically measure roughly three inches on each side, and feature both black and white and colour images from around the world highlighting locations in which the Society was at work and the groups to whom they ministered. Several boxes contain slides showing Biblical scenes that may have been useful for teaching in schools established by SPG missionaries. My particular interest lies in the SPG’s work in Canada in the nineteenth century, and the collection includes fascinating pictures of popular Canadian landmarks. Striking images of Niagara Falls, the Banff Springs Hotel, wildlife, and mountain scenes are all featured on the Canadian slides. Unlike many of the other sets of slides in the SPG’s collection which highlight the day-to-day work of missionaries in schools and churches around the world, most of these Canadian slides were likely used to highlight the famous places and familiar themes in order to pique the interest of British members and donors whose contributions sustained overseas missions. Nonetheless, the images are stunning and represent a wonderful treasure within the SPG’s collection at the Bodleian. Stuart Barnard will be speaking about his research into the SPG archives on February 19, see event listing for details. This year begins with a call for entries to the Colin Franklin Book Collecting Prize, open to students at the University of Oxford. [See: http://www.bodleian.ox.ac.uk/csb/fellowships/the-colin-franklin-book-collecting-prize] Entries are due by 26 January 2015. As inspiration, consider a volume which was part of two different collections formed over a century apart. Edmund Malone (1741-1812) developed from the 1770s onwards a fine collection of early imprints of Shakespeare’s works. Several of Malone’s books and notebooks contain handwritten remarks about the early editions he had already secured, or hoped to buy, and estimations of how his collection outshone others. This was not just trophy-hunting. Malone’s collection supported him in a lifetime of scholarship and literary disputation on the subject of Shakespeare. Some time before 1805, Malone wrote that he was still hunting the first (1593) edition of Shakespeare’s poem, Venus and Adonis. It must have been with great satisfaction — and, yes, the trophy-hunting does shine through here — that he was able to add a note when he paid ‘the enormous price of twenty-five pounds’ to acquire the unique surviving copy from a Manchester bookseller. This particular book had previously belonged in the collection owned by Frances Wolfreston (1607-1677), and kept at her home, Statfold Hall, Staffordshire. She wrote her name on the title page, ‘frances wolfreston, hor bouk’. In her will, Wolfreston left her ‘phisike’ books and ‘godly’ books to her third son, and specified that all the rest, including a rich collection of Elizabethan and 17th-century poetry and drama, could be loaned to any of her sons or daughters to read, but that her son should ensure they were returned, and he ‘shall carefully keepe them together’. * Aided by the inscriptions, her children would remember that these were her books. The Venus and Adonis was not the only unique survival preserved in this collection. See the ‘Wynken de Worde’ blogpost on Frances Wolfreston as a collector, here. The spirit of the Colin Franklin Prize recognizes that book collections fulfil personal aims and express intellectual journeys for readers, and that collections are also for the future; the current rarity, age, or monetary value are not relevant criteria in the judging of the prize. *See the article by Paul Morgan, “Frances Wolfreston and ‘Hor Bouks’: A Seventeenth-Century Woman Book-Collector”, The Library, Sixth series, Vol. XI, No. 3, September 1989. A spectacular travel-sized library from the 17th century is now in the Bodleian Library. 27 November: the first Bodleian Libraries Fellows Seminar heard from three researchers in the Visiting Scholars’ Centre, Weston Library. 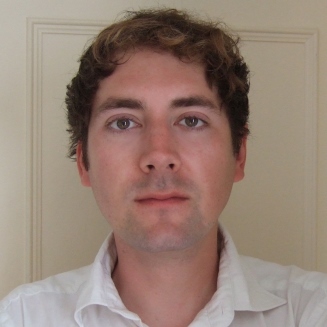 Dennis Duncan (British Academy Postdoctoral Fellow at the Bodleian Libraries, Centre for the Study of the Book) has embarked on a three-year project to write the history of the book index from late medieval times to the present. Dr Duncan presented to the seminar an early-modern instance of the index used as a weapon of character assassination in 1698 when Richard Bentley was satirized by critics deploring his painstaking philology. An item from Bodleian collections, T. B. Macaulay’s heavily and intemperately annotated copy of Charles Boyle’s attack on Bentley, highlighted the continued fear of the index as a potential distortion, rather than distillation, of knowledge. Claire Gallien (Université Paul Valéry – Montpellier 3, and BSECS-Bodleian Fellow, 2014) is extending her work on English Orientalism* to a close study of the manuscript collections which informed 17th- and 18th-century scholarship. Working with the Bodleian Oriental manuscript collections, she will be examining the contribution these materials made to English understanding of the Middle East and of Arabic literature throughout the cycle of collection, from their acquisition to their reading and annotation by English scholars. Mirjam Brusius (Mellon Postdoctoral Fellow in the History of Photography, Oxford) is building on her research into the origins of photography* with further examination of the role of photography in historical and archaeological study during the 19th and early 20th centuries. Her presentation to the seminar focussed on the early history of photography in Iran, outlining in that context the adoption of the technology (notably by the Shah, Nasser al-Din) and the adaptation of aesthetics to the production of photographic records of the Middle East in the middle of the 19th century, including albums produced by European visitors which have survived in library and museum collections. Work in progress from three resident researchers: on 27 November the Bodleian Libraries Centre for the Study of the Book will host a its first evening seminar in the new Visiting Scholars’ Centre. Claire Gallien, BSECS-Bodleian Fellow, will speak about her research into British Orientalism, for which she is examining materials in collections of Arabic and Persian manuscripts bequeathed to the Bodleian in the 17th and 18th centuries. Mirjam Brusius, Mellon Post-doctoral Fellow in the history of photography (History of Art), will speak about her current research into the history of photography in Iran. My Marconi research at the Bodleian Libraries principally focused on two collections: firstly, within the archives of the Marconi company itself, namely the papers of Metropolitan-Vickers (MV), British Thomson-Houston, and their parent company, Associated Electrical Instruments (AEI). I examined the implementation of time studies and motion studies at MV and AEI from the late 1920s onwards, and particularly the involvement of Anne G. Shaw, a former student of Dr Lillian Gilbreth. The second set of materials I worked with were the papers of Sir Stafford Cripps. Cripps was crucial in the expansion of time studies and motion studies in British industry, both as Minister of Aircraft Production in World War Two, and as Chancellor of the Exchequer in the postwar Attlee government. I used these collections to interrogate the frequently-made historiographical claim that the 1945-51 Labour government failed to intervene to increase industrial efficiency at a crucial crossroads in British history. Following my Marconi research, I am now in a position to argue that the Attlee government did successfully intervene in one ill-examined historical zone, the factory floor, but I counterfactually question whether this was the best policy at which to be successful. For more on Michael’s research and time at the Bodleian Libraries, watch this video. 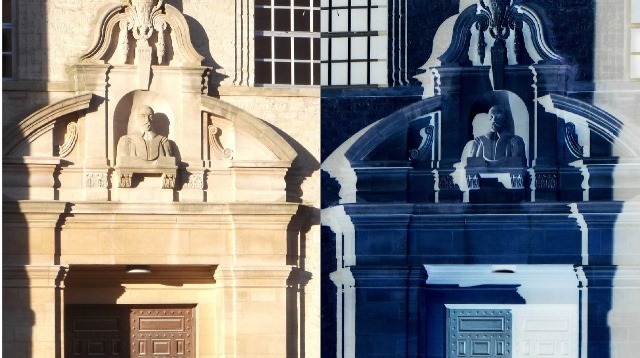 For news on Visiting Scholars at the Bodleian, click here. Georg Bartisch was a surgeon and an inventor, but he is remembered primarily for his Ophthamoduleia (literally ”eye-service”), a treatise on diseases and disorders of the eye. The 1583 text is notable for several reasons. 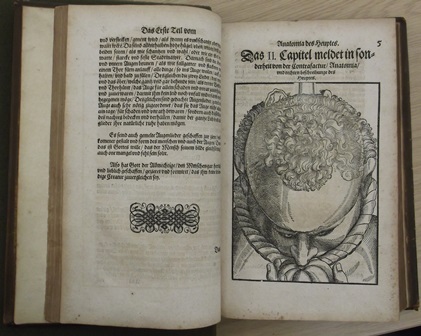 First, it is widely considered the first Renaissance treatise on eye disorders and surgery. Secondly, though most serious texts were written in Latin at the time, the Ophthalmodouleia was published in the vernacular, German. Finally, the book, which Bartisch published at his own expense, included ninety one full-page woodcuts, several of which were layered to act as flaps. 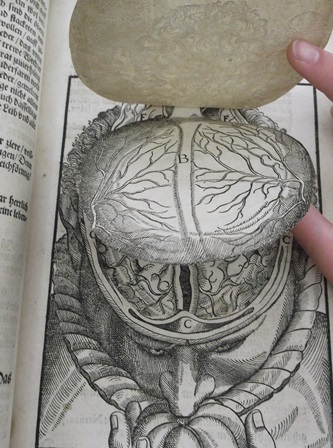 As a result, the reader could examine different layers of the human brain (for example) by flipping through the woodcuts. This experience simulated the process of dissection for students, professionals, and the general public. Bodleian Libraries, Oxford. Douce B subt. 305. G. Bartisch: Ophthalmodouleia Das ist Augendienst. Dresden, Mathes Stöckel, 1583. Bartisch was not the only one – nor the first – to include interactive flaps in his text. Heinrich Vogtherr the Elder introduced the layered flaps to anatomical prints in 1538 when he used 24 woodblocks to create an anatomical print of the female body. Vesalius’ Fabrica, which marks the beginning of modern anatomy, included flaps; and in 1619, Johann Remmelin included 120 flaps in the anatomical illustrations for the Catoptrum Microscopicum, which has been digitised by the University of Iowa. This technique was still used long after the seventeenth century: E.J. Stanley created layered illustrations for an anatomical textbook in 1901. 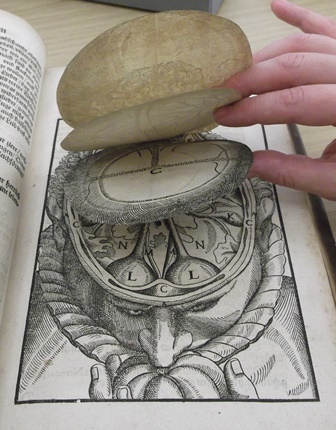 Read more and watch anatomical flap books in action here. An unexpected phone call through to the Map Department recently proved to be the start of a little adventure that had a wonderful outcome…. … the original map of General Gordon’s journey from Suakim to Khartoum, 1874, a donation now at (MS) E4:1 (19). Read the story of how this map came into the Bodleian collections here. In 2011, conservator Andrew Honey wrote about a frisket in the Bodleian’s Broxbourne collection. We repost Andrew’s piece here with a full image and with a link to further information on colour printing with friskets. A frisket used for printing with colour. Bodleian Libraries, Oxford. Broxb. 97.40. The Conservation Section is currently devising a new mount for a parchment frisket cover from the Broxbourne collection. A frisket is the part of a printing press that holds the paper in place during printing. Often covered with parchment, a frisket also acted as a mask to keep inky parts of the press bed from marking the printed paper. The frisket cover (Broxb. 97.40), which is made from a recycled manuscript leaf, was framed behind glass when it came to the library and only one side could be seen. The library’s Rare Books curators asked whether it could be unframed and mounted so that both sides could be seen, and to make it more readily available for study. Once the Broxbourne frisket was released from its frame far more information about its early use and subsequent history could be seen. Manuscript writing can be seen on this piece of parchment, which has been identified as a page of an Italian fourteenth-century Canon Law text. Two centuries later, this discarded piece of parchment from a law manuscript was used to make the frisket. 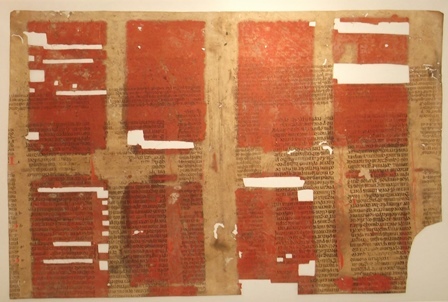 The frisket was used to print the red portion of an octavo-format book in the early sixteenth century, and offers early evidence of two-colour printing processes. Here, areas of parchment were cut away to allow the red-inked type to print initials and so on, while the remaining parchment masked off the text which was to be printed in black. The attached photograph shows the upper side of the frisket cover and a detail of one page in raking light, which clearly shows impressions of type. Now that the frisket cover is out of its frame it can be seen that it was subsequently used as a board lining for a large folio bookbinding. The final question remains – what was it used to print? – Andrew Honey, Conservation, Bodleian Libraries. 2011.